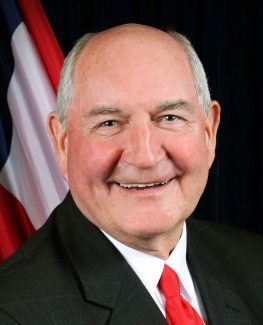 WASHINGTON — U.S. Secretary of Agriculture Sonny Perdue launched the trade mitigation package aimed at assisting farmers suffering from damage due to unjustified trade retaliation by foreign nations. Producers of certain commodities can now sign up for the Market Facilitation Program, while USDA will also begin to purchase identified commodities under a food purchase and distribution program. Additionally, USDA has begun accepting proposals for the Agricultural Trade Promotion Program, which will help American farmers find and access new markets for their products. In total, USDA will authorize up to $12 billion in programs, consistent with World Trade Organization obligations. Perdue announced in July that USDA would act to aid farmers in response to trade damage from unjustified retaliation. President Trump directed Perdue to craft a short-term relief strategy to protect agricultural producers while the administration works on free, fair and reciprocal trade deals to open more markets in the long run to help American farmers compete globally. These programs will assist agricultural producers to meet some of the costs of disrupted markets. "These programs will allow President Trump time to strike long-term trade deals to benefit our entire economy, including the agricultural sector, in the long run," Perdue said. "Farmers will tell you that they would always prefer to sell a good crop at a fair price, rather than receive government aid, and that's what long-term trade deals will accomplish. But in the meantime, President Trump has promised that he will not allow American agriculture to bear the brunt of the unjustified retaliation from foreign nations. Today we are putting the President's promise into action." USDA's Farm Service Agency will administer the Market Facilitation Program to provide payments to corn, cotton, dairy, hog, sorghum, soybean and wheat producers. An announcement about further payments will be made in the coming months, if warranted. USDA's Agricultural Marketing Service will administer a food purchase and distribution program to purchase up to $1.2 billion in commodities unfairly targeted by unjustified retaliation. USDA's Food and Nutrition Service will distribute these commodities through nutrition assistance programs, such as The Emergency Food Assistance Program and child nutrition programs. Through the Foreign Agricultural Service's Agricultural Trade Promotion Program, $200 million will be made available to develop foreign markets for U.S. agricultural products. The program will help U.S. agricultural exporters identify and access new markets and help mitigate the adverse effects of other countries' restrictions. The sign-up period for MFP is now open and runs through Jan. 15, 2019, with information and instructions provided at http://www.farmers.gov/mfp. The MFP provides payments to cotton, corn, dairy, hog, sorghum, soybean and wheat producers who have been significantly impacted by actions of foreign governments resulting in the loss of traditional exports. The MFP is established under the statutory authority of the Commodity Credit Corporation CCC Charter Act and is under the administration of USDA's FSA. Eligible producers should apply after harvest is complete, as payments will only be issued once production is reported. A payment will be issued on 50 percent of the producer's total production, multiplied by the MFP rate for a specific commodity. A second payment period, if warranted, will be determined by the USDA. MFP payments are limited to a combined $125,000 for corn, cotton, sorghum, soybeans and wheat capped per person or legal entity. MFP payments are also limited to a combined $125,000 for dairy and hog producers. Applicants must also have an average adjusted gross income for tax years 2014, 2015 and 2016 of less than $900,000. Applicants must also comply with the provisions of the Highly Erodible Land and Wetland Conservation regulations. For more further information or to locate and contact local FSA offices, interested producers can visit http://www.farmers.gov. Beginning last week, USDA's AMS will issue pre-solicitation notices through GovDelivery for targeted commodities. These notices will outline products USDA intends to purchase and will continue over the next several weeks. AMS will purchase products over four quarters in the new federal fiscal year, which starts on Oct. 1, 2018. The materials purchased may be adjusted between quarters to accommodate changes due to growing conditions, product availability, market conditions, trade negotiation status, and program capacity, among other factors. Applicants may now submit proposals for the FAS $200 million ATP Program. FAS will accept applications on a rolling basis until Nov. 2, 2018. Details regarding ATP and how to apply are available at https://www.fas.usda.gov/programs/agricultural-trade-promotion-program.